The main backing tracks were recorded with Kevin Poree at Berry Street Studio, a favourite haunt of ours. 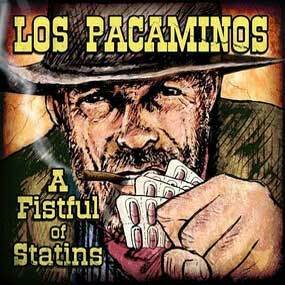 Paul, Drew and Jamie have been recording both demos and finished recordings there for the last 15-20 years, and the first Pacaminos album was recorded there in much the same way. That took care of most of the drum & some bass parts. After that, we took rough mixes home and some additional overdubbing was done down at Matty’s studio, like harmonies, vocals, Bajo Sexto, trumpet parts etc. Paul did some vocals at home, along with the harmonica, some Bajo licks and a small guitar part. Jamie did some bits at his place and all these parts were transferred back at Berry Street, then the final bits & pieces were done; any extra Pedal Steel, more guitars, harmonies, and the mixing.